In the Forex market the term margin is most often referring to the amount of money required to open a leveraged position, or a contract in the market. It may also be used to describe the type of account, i.e. margin account; meaning that an account is being traded on borrowed funds. It is generally safe to assume that all off-exchange retail foreign currency (or Forex) traders are trading within margined accounts. Without leverage, or the ability to trade on borrowed funds, a trader placing a standard lot trade in the market would need to post the full contract value of $100,000 in order to have his or her trade executed. Trading with a margined account allows traders to utilize leverage, meaning that the same $100,000 contract can be placed for an amount of margin determined by the set level of leverage. An account at 100:1 leverage would require $1,000 of margin to place a $100,000 trade. The table shown in figure 1 illustrates the amount of margin required to open standard, mini and micro contracts, also referred to as lots. As can be seen, at 1:1 leverage (no leverage at all) the full value of a contract is required. 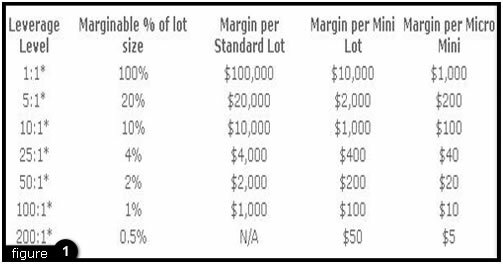 The table illustrates the required amount of equity on margin per lot traded. Default leverage levels for new accounts are set at 200:1 for Mini accounts and 100:1 for Standard accounts. * These levels have been set by JMI, and will likely vary from broker to broker within the retail Forex industry. * 200:1 is the entry leverage value. Since most brokerages will have margin calls set at different level, exact leverage may vary. Simply stated, trading Forex on margin increases your buying power. As an example: a trader with $10,000 in a margin account that allows 100:1 leverage, would be able to purchase a maximum of $1,000,000 in currency contracts (10 standard lots). At 100:1 leverage 1% of the contract value is required as collateral. By trading on margin, traders can potentially increase their total return on investment with less cash outlay. Trading on margin should be used wisely as it magnifies both your potential profits AND potential losses. A good rule of thumb to follow is the higher the margin, the greater the risk. A trader with a $10,000 account balance decides that the US Dollar (USD) is undervalued against the Euro (EUR). The current bid/ask price for EUR/USD is 1.2348/1.2350 - meaning a trader can buy 1 EUR for $1.2350 USD or sell 1 EUR for $1.2348 USD. The trader decides to sell EUR (buy dollars) by selling 1 standard lot. With leverage at 100:1 or 1%, initial margin deposit for this trade is $1,000, leaving the account balance at $9,000. As anticipated, the EUR/USD drops 48 pips to 1.2298/1.2300. To exit the position the trader would close 1 lot at 1.2300 In this scenario the trader has realized a profit of 48 pips or $480 US Dollars. Trading with a heavily margined account is a double-edged sword. Trading utilizing high leveraged accounts can potentially increase profits, but it increases your risk of potential losses. Most brokers have standard leverage levels - 100:1, 200:1 or even 400:1. Remember, the higher the leverage, the higher the risk. Traders in the Forex market are subject to the margin rules set by their chosen brokers. In order to protect themselves and their traders, brokers in the Forex market set margin requirements and levels at which -s are subject to margin calls. A margin call would occur when a - is utilizing too much of their available margin (cash deposit towards an open position). Spread across too many loosing trades, an over margined account can give a broker the right to close a trader's open positions. It is important that traders new to the Forex market take the time to understand the risk associated with trading in a margined account. Every trader should be clear on the parameters of their own account, i.e. at what level does their broker consider them subject to a margin call. Be sure to read the margin agreement in the account application when opening a live account. The positions in a trading account could be partially or totally liquidated should the available margin ("Free Margin") in the account fall to the predetermined threshold of 50% margin level. * This is a level set by JMI, other brokers may have margin call levels set differently. Traders should monitor margin balance on a regular basis and utilize stop-loss orders to limit downside risk. However, due to the extreme volatility that can be found in the Forex market, stop-loss orders are not always an effective measure in limited downside risk. There is still the possibility of losing all, or more, of your original investment. The maximum available margin is 1% (100:1 leverage) for standard accounts and 0.5% (200:1) for mini accounts. Traders always have the option of setting a lower level of leverage. Doing such may help some traders manage their risk, but bear in mind that a lower level of leverage will of course mean that larger margin deposits will need to be made in order to control the same size contracts. The requirements for leverage may vary with account size or market conditions, and may be changed from time to time at the sole discretion of JMI. Please refer to your trading agreement for details. If maximum leverage is employed, traders must maintain the minimum margin requirement on their open positions at all times. It is the customer's responsibility to monitor his/her margin account balance. JMI Brokers has the right to liquidate any or all open positions whenever a trader's minimum margin requirement is not maintained. This is an important risk management feature designed to strictly limit trading losses in your account. To calculate the margin required to execute 4 mini lots of USD/JPY (40,000 USD) at 200:1 leverage in a $500 mini account, simply divide the deal size by the leverage amount e.g. (40,000 / 200 = 200). $200 margin will be required to place this trade, leaving an additional $300 marginable balance in the trading account. The trading platform automatically calculates margin requirements and checks available funds before allowing a trader to successfully enter a new position. If there are not adequate funds available to enter a new position, traders will receive a "Not Enough Money" message when attempting to place the trade. *For a further explanation on calculating margin percentages and the potential for a margin call, please see the following course.